This section contains a range of resources developed to support and assist Partnerships in getting up and running. The Guidance Documents will be added to over time and any amendments reflected in the date and version number. Issued in April 2017 this 16-page document provides some initial information for partnerships across a wide range of aspects. It includes an outline remit for a Partnership Development Group. Over time we will be issuing more detailed guidelines covering a range of key aspects of partnership development. Please provide us with feedback on these and how they might be improved upon. This document, first issued in June 2017, offers advice and suggestions about producing a Development Plan for your Partnership. The ‘template’ included in the appendix is just an example that you may wish to adopt, adapt or ignore. It is purely fictitious but hopefully contains enough realistic prompts to give a general idea of the approach. Letter to Partnership Deans – Finance and Administration in new Partnerships. Guidelines for the operation of Partnership Bank Accounts. Guidelines for Partnership Finance Committees. Frequently Asked Questions on partnership finance. The previously published Guidelines for Parish Finance Committees are also available. We have been asked for advice about the role of the role of the Chair of the Partnership Development Group and the sort of skills such a role requires. This document might provide a useful starting point. 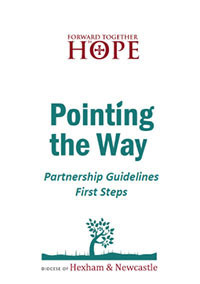 Issued in May 2017, this 8-page document provides a concise summary of the first part of the very substantial ‘Pointing the Way’ report discussed by Bishop Séamus and the Board of Trustees at their residential meeting in January 2017. The themes it contains emerged from the listening exercise that took place during Forward Together in Hope and draw from the numerous questionnaire responses, meetings and informal conversations. The Youth Ministry Toolkit is an online resource, providing ideas, inspiration and practical help and information for partnerships in our Diocese. This resource will aid partnerships to respond to the needs of young people and encourage them to take their place in the Church and contribute to the wider community. Content previously displayed in this section has been moved to a permanent location ('Discipleship Resources') within the Department for Adult Formation area of our website and is available to view here. Edition 7 - August 2018. Edition 6 - June 2018. Edition 5 - April 2018. Edition 4 - February 2018. Edition 3 - December 2017. Edition 2 - October 2017. Edition 1 - August 2017.